Organic almond butter might be your best ally in the battle of the bulge. What? Delicious, rich almond butter with its calorie count will help lose weight? Yes. That’s right. The International Journal of Obesity and Related Metabolic Disorders compared overweight adults who stuck to a low-calorie intake high in complex carbohydrates with others who ate a low-calorie diet high in almond-rich protein. Results showed that those who ate almonds fared far better than those who did not. The subjects who ate the almond-enriched diet consumed 39% fat, but of that 25% was monounsaturated. In contrast, those on the diet high in complex carbs ingested 18% fat, but 53% was derived from carbs and only 5% monounsaturated fat. Another study in the British Journal of Nutrition investigated the results of eating just two ounces of almonds a day (otherwise no other recommendations for changing eating patterns). The participants were followed for six months; and those who ate almonds ingested fewer trans-fatty acids and ate less meat, salt, and sugar – all reductions believed to improve cardiovascular health as well as benefit diabetes management and the control high blood pressure. Regularly adding organic almond butter to your diet is an easy way to make the most of the natural benefits of almonds. Almond butter is delicious (you don’t feel you are sacrificing flavor or taste!) and packed full of healthy vitamins, minerals, and antioxidants. When you eat almonds or organic almond butter, even in combination with carbohydrates, they work to help keep your blood sugar regulated, which in turn provides you with lasting energy. As an added bonus, organic almond butter with its Omega 3 fatty acids, helps to lower cholesterol and strengthen bones. 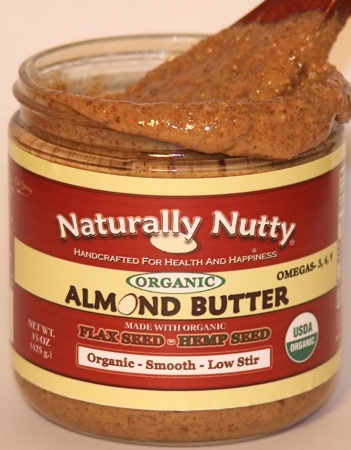 What could be better than all the healthy benefits of organic almond butter! How easy it is to make delicious snacks and meals. Just a tablespoon of organic almond butter spread on toast, bagels, celery sticks, or crackers makes for a quick and satisfying snack. You can substitute it in any recipes that call for peanut butter or add a tablespoon to a smoothie for yummy protein enrichment. When you eat almond butter, your blood sugar won’t spike and you will be much less tempted to give in and opt for junk food. Feeling full and satisfied is very important if you want to stay focused on healthy eating and lose weight. Make keeping to a healthy diet work for you by adding organic almond butter to your daily meals. Check out our handmade, artisan Naturally Nutty almond butters for delicious ways to help you lose weight without sacrificing taste.